Having been a professional photographer specializing in landscapes for many years it was perhaps surprising that I didn’t realize how challenging this was going to be. 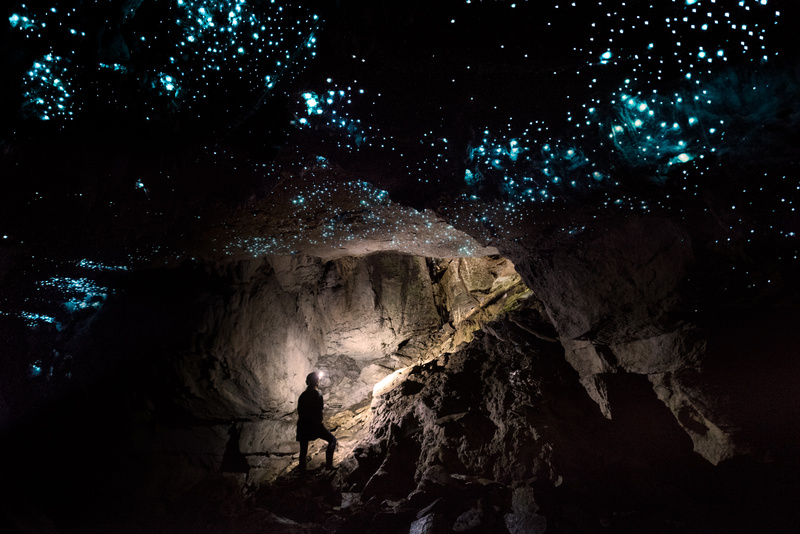 Our guide Heath did give me ample warning – ‘These caves are completely and utterly pitch black, it’s like another world down there.’ I had wanted to see Glowworms for many years and I was really excited to get the opportunity to spend a couple of hours photographing them. 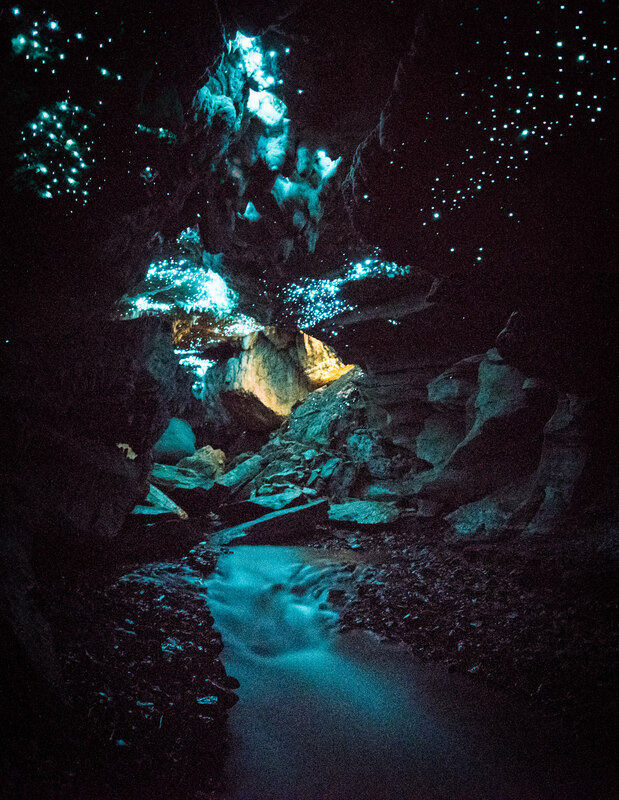 We were in a cave in Waitomo in New Zealand’s North Island. 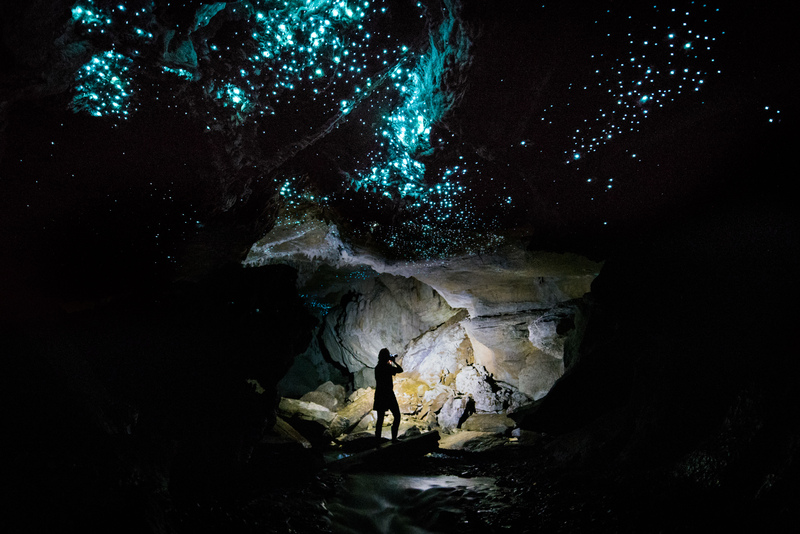 Glowworms can be found all over the country in lakes and forests but Waitomo has a high concentration and is famous for them. 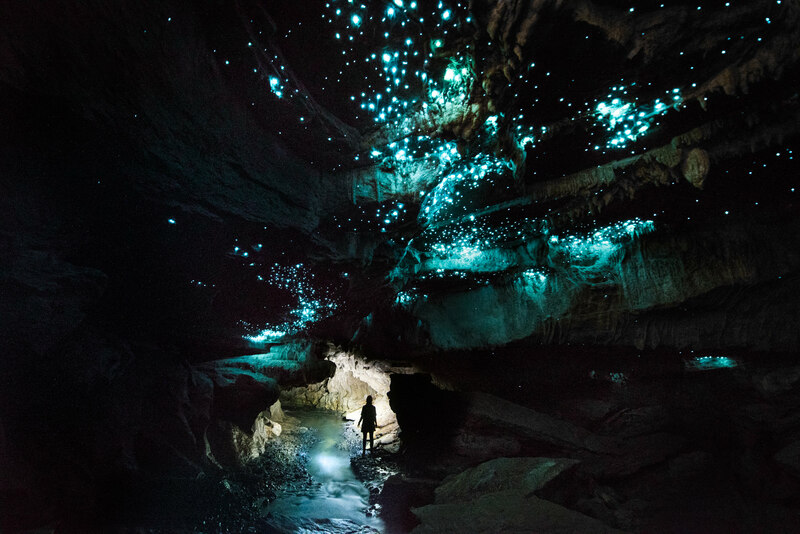 “Glowworms are actually the larval stage of an insect called the Fungus Gnat,” Heath tells us, as we push our way through the flowing water. 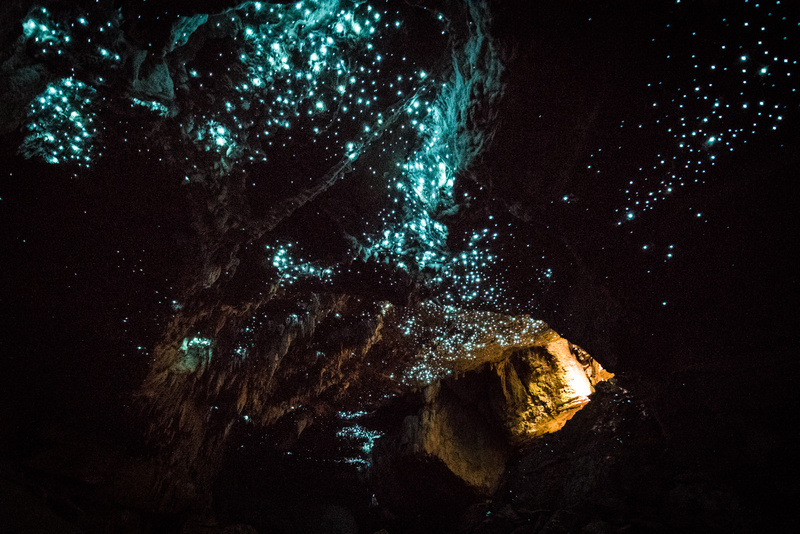 “The bioluminescent light they produce is used to attract other insects. Around the light the glowworms hang sticky threads, which they use to catch the insects and then eat them, much in the same way a spider does in its web”. It took half an hour of clambering over slippery rocks, making our way down in the cave as it progressively got darker before we finally got to the spot. We turned our torches off and it took a second for my eyes to adjust before I started to notice them. Thousands of blue dots filled my vision in a spectacle that rivals the Milky Way. They produce a beautiful light that shimmers off the stream beneath my feet and stretches off into the distance. I was shooting with the Nikon D810 at the time. An excellent camera for low light photography, with a high resolution sensor and great dynamic range. I chose the 14 – 24mm Nikkor f/2.8 which is also a great choice for low light, with a wide aperture. A tripod was absolutely essential and I used the Manfrotto 190GO! In many shots the tripod was half submerged in a fast flowing stream so it needed to be sturdy and it did a great job. I found it was so dark my exposures were lasting up to 5 minutes, even at f/2.8 with a very high ISO. For extra stability I wedged the tripod legs between rocks. The 190GO! is really handy to set up as it just uses a twist to extend the legs, meaning you can keep your gloves on in the cold. Patience and time is definitely the key to photographing Glowworms. I experimenting adding a little torch light to silhouette my girlfriend in the cave, and it also added that little extra light to help with the exposure. The great thing about exposures this long is you really get the time to sit and enjoy the environment. I will never forget those 2 hours, sitting in the dark in one of the most magical atmospheres I have experienced. 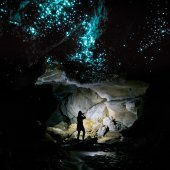 If you want the opportunity to photograph Glowworms yourself, I would recommend you pay for a special photographic tour (which gives you the time and space to do it properly). Alternatively, there are plenty of areas you can access yourself that aren’t on private land. If you do a little research beforehand you can find plenty of areas around the country on Google.